And not only eyes, but nasty little claws as well. These little crabbies are Pu Na Kem, rice field crabs, so called because of their natural habitat, the swamp-like rice fields of central Thailand. They are pickled raw, and used in the famous Som Tum and various Yum salads. There is even a coconut relish made with these salty crabs. They are not the most healthful of ingredients, if truth be told. 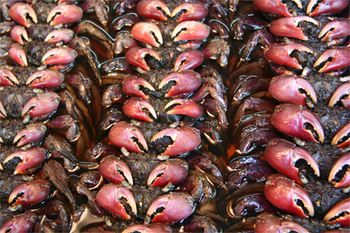 These Pu Kem have got all sorts of parasites and germs they can transmit if eaten raw, which is how they are most usually served. It doesn't seem to stop to many people in Thailand though. It's been said that one could buy pretty much everything on the streets of Bangkok. I suppose I have a proof. I found a book called "Story of My Life" by someone who called herself Marie, Queen of Romania, in French, no less. 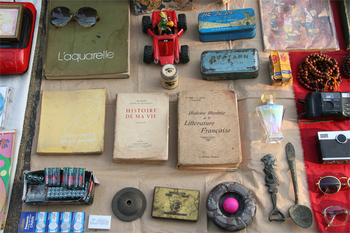 The book was neatly laid out on a paper mat, next to the Illustrated History of French Literature, and amidst other odds and ends that proved more than a little odd and quite near the end of their respective lifespans. Another ubiquitous street food in Bangkok, Gluay Ping, grilled banana in palm sugar syrup. The banana used for this is called Gluay Nahm-wa, which is shorter and fatter than the regular banana you see in your supermarket. It's also common to use slightly unripe Nahm-wa bananas for this, as the ripe ones tend to fall apart after grilling. The grilled bananas are sometimes flatten slightly, and doused in a syrup made by simmering palm sugar, water, and salt. When I was little, I loved Gluay Ping made of greener bananas than usual. Green bananas develop a taut skin that's almost caramelized on the charcoal grill. Biting into one, the almost crisp skin gave way to a melting soft and sweet interior that's enhanced by the salty and sweet syrup. Simply delicious. This is a product of a random wandering around Yaowaraj the other day. Bangkok's old Chinatown is even more bustling than usual, thanks to the impending new year celebration this weekend. I took a bunch of photos, they'll all be flickring once I get to a faster internet connection, which might be San Francisco! This shot is from a window display at a Chinese herbalist. Yes, those little guys are precisely what you think they are. 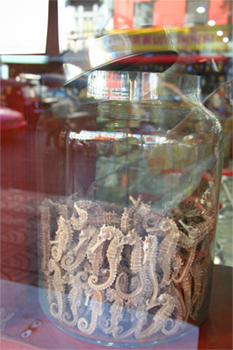 Dried sea horses. I have no idea what they are used for, some obscure Chinese remedy, probably. Perhaps some of you might be inspired enough to pencil this into your calendar. The Commonwealth Club of California will be hosting a panel of food bloggers on Monday February 6. Heidi of 101 Cookbooks, Alder of Vinography, Bruce of Saute Wednesday, and yours truly will be on the panel, to be moderated by Amanda Bernes of the San Francisco Chronicle. I'm not exactly sure how my frivolous blog came to find itself listed on the same program as a discussion of William Faulkner and a talk by the venerable BHL, but there it is. The event will begin at 5.30pm, at the Ferry Building. Ticket price is $12 for the Commonweath Club members, and $22 for us mere mortals. I hear that the space is filling up fast, so if you are interested you might want to secure your spot soon. I also hear there will be a wine reception, so -as my friend Alder so aptly pointed out- even if we all turned out to a great big bore you could just keep drinking the wine. Stop by to say hi if you are Chez Pim readers, I'd love to meet you. Kanom Tua-pab, tender rice flour dough enveloping a mixture of mung bean, coconut, amd sesame seeds, and covered in coconut flakes. They are eaten tossed with sugar, crushed sesame seeds, and salt. Kanom Tom, the same rice flour dough but this time stuffed with coconut flakes cooked in a caramel made of palm sugar. Kanom Niaw, the same dough again, but rolled into a little worm shape, eaten with palm sugar caramel syrup with sesame seeds. 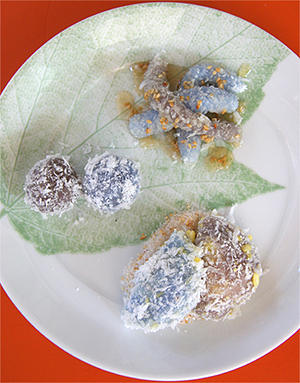 The blue hue in these desserts came from Dok Anshan, a type of blue flower that I don't know the name in English. The ashy-gray hue came from, what else, ash. 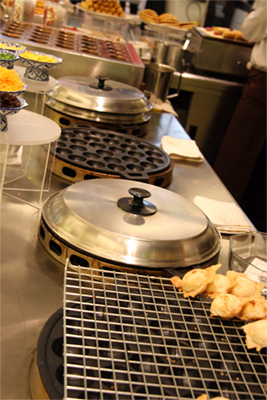 Thai sweets, unlike our savory dishes, could be something of an acquired taste. The sour, sweet, salty, bitter and spicy balance of Thai savory dishes are easily appreciated, but somehow, the odd textures and shapes of Thai desserts can be off-putting to many. Not helping the matter is the fact that it has become increasingly difficult to find great Thai desserts, even in Thailand. Thai dessert making requires intricate skills, and depends a great deal on the quality and freshness of ingredients, coconut milk and meat, palm sugar, rice flour and other essentials. While fresh ingredients is expensive and the process of dessert making can be arduous, Thai traditional desserts can't really be sold for a lot of money, unlike fancy Western style desserts, so only a few vendors even bother to make them, or make them properly as they are often forced to use canned coconut milk and artificial colors to cut cost. The other day I had a craving my favorite curries, Gang Kiew-wan Pla Grai, green curry with fish dumplings. So I had some made for me. Pla Grai is a type of fresh water fish known for its sweet flesh which has a particularly toothsome quality when made into dumplings. It is traditionally used in green curry with Krachai or wild ginger. I had a lot fun watching Pa Sai, our wonderful cook, made this dish so I took a lot of photos. 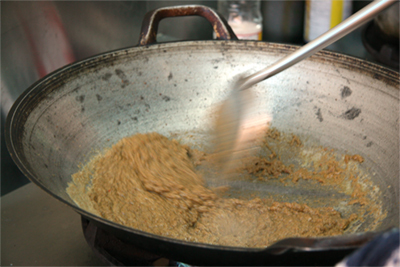 Here is a little photo essay of the making of Gang Kiew-wan Pla Grai. No they are not wiggly worms. Not even the green ones. 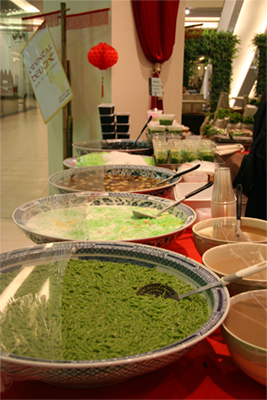 They are wiggly little dessert 'noodles' called Lod-chong. Lod-chong is made by passing the soft dough made of flour, water, and Pandan juice (which gives the noodles the green color) through a special instrument that's like a spatula full of little holes placed on top of a pot of boiling water. The long stream of dough is cut off with a knife every couple of inches, creating little worm looking pieces rather than long pieces of noodles. These little green worms are served in a bowl with sweetened coconut milk and plenty of ice. Trust me, they taste better than they look (and sound). Back in the old days the coconut milk used to be sweetened with a simple syrup that has been infused with fresh jasmine flowers. In that case, they tasted, and smelled, better than they looked (and sound.) Frankly, these days, I'm happy just to find Lod-Chong that are actually made with Pandan leaf and not artificial green color. Jasmine or no jasmine. These innocent looking little bits. They shall be the ruin of me. What are they? They are called Kanom Krok. They are the most delicious little morsels, made of coconut milk, sugar, and just a little salt. As simple as that, and as delicious as anything. Evil. You see. It's pure evil. I have been eating them by the box full, every time I made it anywhere within the one mile radius of where they're sold. And that's a lot, you see, because these things are sold at the Emporium food hall, on Sukhumvit road. My parents's house is also on Sukhumvit, you see, and every time I go anywhere I would have to pass it front of it. I've had four boxes, so far, in two days. At this rate, with all the coconut milk and the sugar, I'd probably double my weight in not too many days. 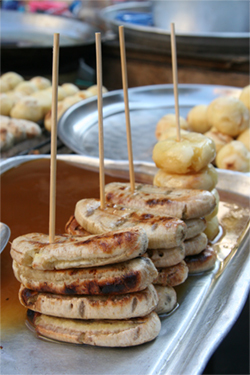 Kanom Krok is a ubiquitous street food in Thailand. They are made in a cast iron or terra cotta pan with dimples. The mixture of coconut milk, sugar, and salt is poured into each dimple, and the finished Kanom Krok scooped out with a spoon. 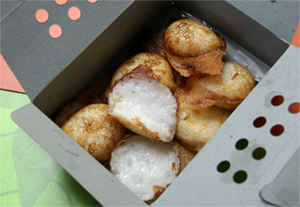 Kanom Krok is crispy on the outside and oozing soft in the middle. Just delicious. How many times have I said delicious? Oh dear. I. Need. Help. Here I am, in Bangkok again. I looked back at the post I wrote on the blog when I cam home last time, and found that my sentiments are still exactly the same. It has been two days now in Bangkok. On one hand it felt like a blink of an eye, but on the other it appeared as though it has been forever since I returned. Thailand always evokes such contradicting reactions in me. I had forgotten how busy Bangkok was. The traffic here is unbelievable. Nearly half my waking hours have been spent in the car, sitting in traffic. It was good that I didn't have to drive. 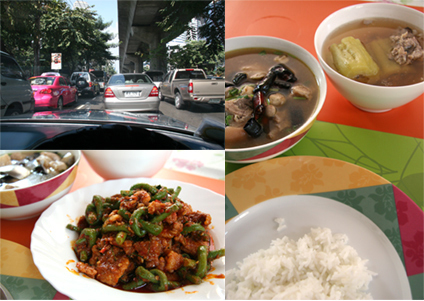 I have long ago lost my ability to navigate Bangkok traffic, not to mention the changing landscape of the city. Bangkok is heavy on one's senses. Mine is almost overloaded. I feel increasingly as though I am an autistic child in need of a shut down. The streets are clogged with vehicles, the sidewalks full of people, the buildings close together. There are just too many bloody people in this city. And I haven't even started on the noise yet. Close you eyes and imagine a room full of kids practicing on the drums and other extremely loud musical instruments. The noise of Bangkok is worse than that scene you've just conjured up in your head, at all hours.